What it is: Ginger (ginger root) comes from the plant Zingiber officinale and is consumed as a spice or used as medicine. The edible parts of ginger include the rhizomes (purgent underground stems) and the above-ground stems when they are young and tender. Where it’s from: The name ‘Ginger’ comes from the Middle English word gingivere, although it dates back to over 3 000 years. Native to South Asia, it has since spread to East Africa, and is also very popular in the Caribbean Islands. Where it’s produced: Some of the biggest suppliers of ginger include India, China, Jamaica, Africa, Indonesia and Nepal. India grew over a quarter of a million tonnes of rhizomes in 2003, which is almost three quarters more than the ginger grown 30 years ago. What it tastes and looks like: Ginger has bulbous little joints from which small bumps grow. It’s light brown with an ivory, pale green flesh. It has a peppery flavour with a hint of sweet lemon, with an aroma that’s pungent and sharp. How to eat/use it: Ginger produces a hot, fragrant spice and, among other things, can be steeped in boiling water to make ginger tea. You can store ginger, use it in a range of different forms, or use at as medicine to soothe bellyaches or reduce inflammation. Available in six forms (fresh, dried, pickled, preserved, crystallised or ground), fresh ginger can be grated or chopped for a dish, while ground (powdered) ginger can be used in sweet, dessert dishes or curry mixes. A good source of: Great news is that ginger only contains 80 calories per 100g and no cholesterol. It also consists of the essential vitamins and nutrients required for optimum health, such as pyridoxine (vitamin B6), pantothenic acid (vitamin B5), calcium, magnesium and potassium. Benefits: The benefits of ginger are endless! Ancient healers used ginger to cure a wide variety of ailments and today, scientists have already discovered that ginger can kill certain cancerous cells and prevent the growth of others with its anti-inflammatory properties. 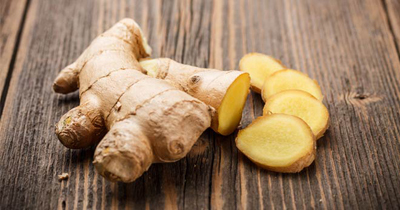 As a result of these properties, ginger also has the ability to combat a wide variety of diseases and conditions. Some of which include healing ulcers, relieving nausea and preventing neuronal plaque – a symptom of Alzheimer’s disease.